Everyone has a terrifying story from their past that involves a doll and a dark room. Those dead glassy eyes of theirs just seem to follow you around, watching your every move. So, yeah... sleeping wasn't always the easiest task in the room that held all of those creepy old-timey dolls at grandma's or that one friend's house or maybe it was your own room. They seem to always hold a look upon their faces afflicted by neglect, a mixture of terrible sadness and growing hatred. It is just downright scary! 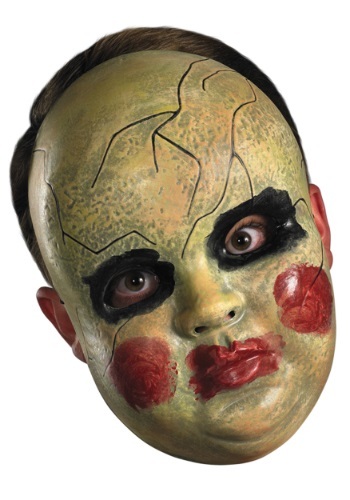 Now, you can match this look of horror from your childhood with this Adult Smeary Doll Face Mask! You'll look like something come to life out of an antique store in a horror flick. If you know anyone that happened to miss out on a scary doll story in their own past then, with this mask, you can have the honor of haunting their dreams for years to come!